400 million people live along the course of the river Ganges and are dependent on water originating from the Gangotri glacier. 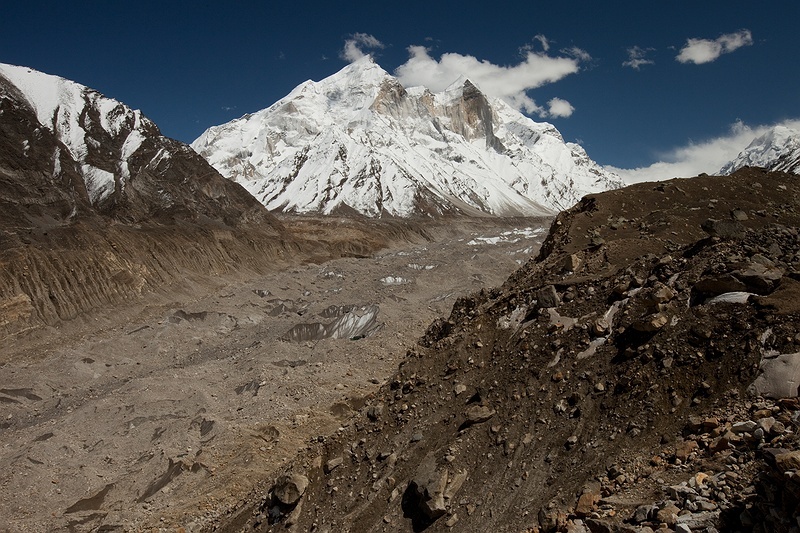 According to a world glacier inventory created by NASA, the United States Geological Survey and the National Snow and Ice Data Centre, Gangotri has retreated more than 850 metres in the past 35 years. It is an odd, scary feeling to climb over rocks and boulders held up by a moving body of ice. In several places deep gorges have formed and the melting ice glistens. A muffled rumble followed by a rushing sound booms from within the depths of the glacier. "The quicker we trek over the less likely there'll be accidents," cries Bardev Singh our guide making annoyingly light work of the agonising trek. High mountains soar to the sky on both sides of the Bhagirathi tributary, the river that eventually turns into the mighty Ganges. Since measurements began in 1780 the glacier has been receding. However, data from the period from 1936-1996 shows the average rate of retreat was 19 metres per year, a rate that has increased to 34 metres per year. This great ice sheet has provided life to Indian culture and it is not surprising that the Gangotri glacier is deemed to be heaven on earth. 18 kilometres from the nearest village and 4,000 metres above sea level it is undeniably heavenly, but very hard to breathe. Bardev Singh has worked here collecting meteorological data for the National Institute of Hydrology in Roorkee since 1999. Four times a day he takes water samples, monitors river flow and records the weather. He is also responsible for measuring how much the glacier melts away every summer. "In recent years it has decreased by about 30 metres per year and the melting is accelerating. It is very worrying, but what can I do? It will be here a long time, but we know little of what is happening inside." In the mid-60's an average of 1.2 metres of snow fell on a normal winter day, now it is less than 20 centimetres. "The weather up here has become warmer and more unpredictable. Two years ago we had lots of snow and had to shovel paths. This winter only a metre of snow fell and it all melted away in two weeks" says Bardev. The 30 km long ice sheet seems to be welling between the high mountains. Melt water roars underneath Gaumukh, the glacier mouth that translates as 'cows mouth' in Hindi. We all stand mesmerised by the rushing ice cold water, admiring this miracle of nature releasing life and power to so many along its journey towards the sea. On the way back to the base station in Bhojbasa we pass Spartan-clad pilgrims in sandles, carrying only a blanket and a water bottle, trekking to take a dip in the icy water by the glacier to purify their souls.